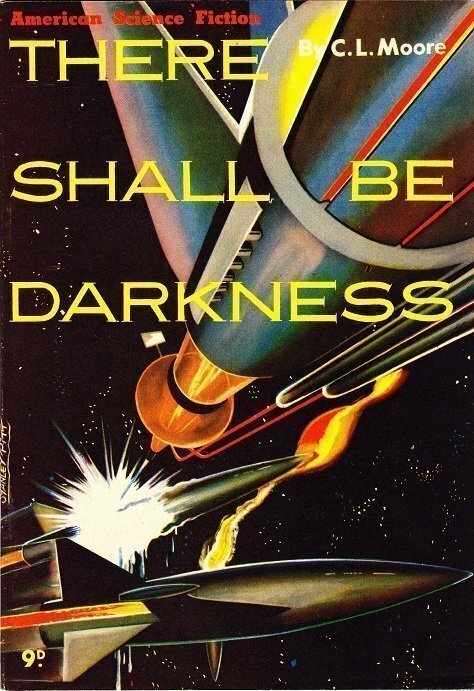 Here we have the first full solo publication of C. L. Moore’s epic space opera There Shall Be Darkness published in Australia by the Malian Press as part of the American Science Fiction Magazine series. I hope fans of Moore don’t take this in the wrong way, but, I rather call this novella a “slush-opera.” No disrespect to CLM, but, it’s plain awful. When I first attempted to read it, I kept putting it down. (DISCLAIMER: Just because I do not like a story by an author, this does not mean I dislike all their works.) But hey, it is a redeemable edition since it is graced by the usually wonderful and original Stanley Pitt cover art. All Terrans are being removed from the barbaric planet of Venus. Commander James (Jamie) Douglas—whom really should purely be referred to as Jamie altogether, as Moore never touches upon his true birth name save the initial meeting—is instructed to pack and depart for Earth. His love interest, a sensual Venusian beauty, comes up with numerous deceitful ways to try to trick him to either take her with him to Earth, or to stay on Venus with her forever. If you hate anyone, this is the book to recommend to them. If you feel outwardly repugnant toward me for this review… I don’t care. It’s my personal opinion. What matters is that I want to hear YOUR opinion. What did YOU think of the story? Was it good? Horrible? How did it stand the test of time? Was it poorly written SF even then?